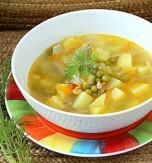 We propose you one more recipe for a potato soup. This potato and mussel soup is amazing. When you want to cook an unusual or special dainty dish then you don’t need to go to a restaurant while you can boil a soup with mussels at home. Such dish will surprise your guests for sure. Thereunto the dish is nourishing and healthy while mussels contain proteins, lean fat and carbohydrate. Peel and chop a bulb onion and a clove of garlic. Sauté the ingredients on preheated dairy butter. Add scrubbed mussels (discard any that are broken or open) and thyme twigs. Stir the ingredients and pour above enough water to cover everything. Season the mass with salt and pepper. Bring it to boil and stew under lid over low heat until the mussels open. Then remove the pan from heat. Transfer the mussels to a plate and filter the broth. 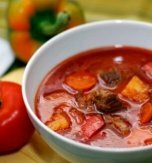 Combine together the prepared and vegetable broth in a pan. Bring the broth to boil. Add peeled and diced potato. Salt and pepper the soup. Boil it over low heat till the potato is soft. 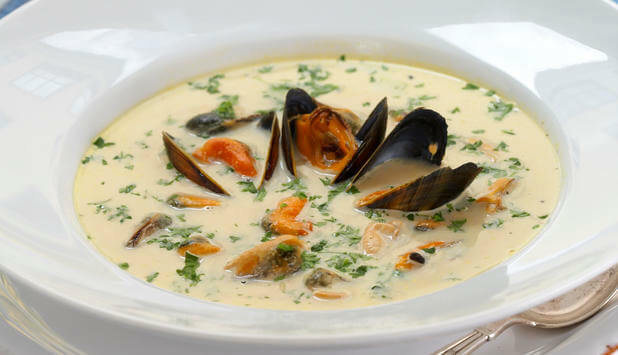 Remove the mussels from their shells and add the mussels to the soup. Pour the cream to the pan and cook the dish over low heat for 2 minutes (don’t bring the soup to boil). 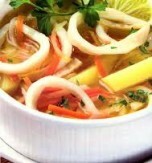 Spoon the soup into serving bowls and top it with fresh parsley before serving. 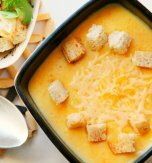 Treat the dish with crusty white bread. 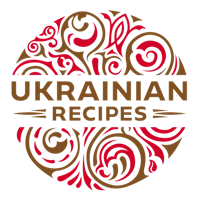 Do you have a favorite Ukrainian recipe for a soup with seafood? If so, please let us know in the comments below or write us an e-mail.